Despite its Rolls Royce price tag this product lacks a proper ergonomic design, and offers an extremely limited option of one desktop size. It's a one-size-fits-all design that's got even fewer options than the 2007-vintage Steelcase Walkstation treadmill desk that it imitates. Sure, there are some improvements with the embedded LCD control console and an integrated plug bar at the back edge of the desktop, but nothing remotely worth the ticket price. Delivery charges may vary by distance. Shipping to Seattle was $246.51. Usually ships within 3 to 5 days (from Amazon). FREE Shipping for Prime members. Work surface available in only one size: 31.4" x 40.0"
No explanation given on website, and no options offered in the shopping cart, although pictures show a monitor arm (and a monitor, keyboard and mouse, which certainly doesn't come with the unit). No height specs are provided by the manufacturer other than: User Height Range 4'10" - 6'6". We find that hard to believe. Treadmill user weight capacity is claimed to be 350 lbs. There is no weight capacity rating published for the desktop. 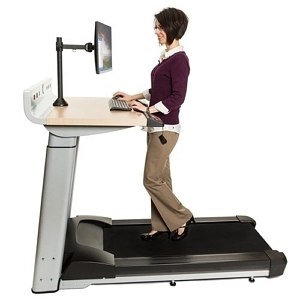 Compared to similar products like the aged Steelcase WalkStation, the InMovement Treadmill Desk features an updated, slightly more ergonomic control console setup using a small LCD screen embedded on the right side of the desk instead of a membrane keypad console that slides out from the center of the desk. It also has a fancy plug bar integrated into the desktop. Compared to anything else— which it practically photocopies—the InMovement treadmill desk is unexceptional, still suffers from the same ergonomic deficiencies as the WalkStation, and is severely overpriced. InMovement is apparently all about copying technology that's nearly a decade old and spinning it to the marketplace as something completely new. And they're doing it with great fanfare and an outsized marketing budget. Unfortunately, this treadmill desk is an imitation of the Steelcase Walkstation, possible the most antiquated, ergonomically-egregious designs on the market. The $4,600 price tag is jaw-dropping in the face of so many better products available at a much lower price. The company's lack of disclosure of even the most basic performance specifications, and lack of response to our invitation for a full evaluation lab review, leaves us with the distinct impression that the treadmill desk specifications aren't impressive. Traditional cardio fitness equipment manufacturers have been taking notice of the new office fitness craze of late, and several have already started to try and break into the treadmill desk business. Most recently we reviewed both ProForm‘s and NordicTrack‘s contrived entrants, neither of which impressed our expert review team. Joining them now is an integrated walking workstation from InMovement, a new sub-brand of cardio giant Life Fitness (owned by global conglomerate Brunswick Corporation), specifically targeting the office worker. In addition to the new treadmill desk their website shows four desktop riser products that look to be direct knock-offs of Ergotron’s Workfit series, all made in China. We’ll be curious to review those products as well. InMovement’s new treadmill desk appears to be aimed directly at the Steelcase Walkstation, with a similar sky-high price point of $4,599 and a one-size, one-color-fits-all product strategy. While we work on a more comprehensive review of the InMovement Treadmill Desk, here’s a preview of what we can tell from publicly available information. Whenever we can’t get a manufacturer to provide a sample unit for testing at the WorkWhileWalking labs we instead conduct a “forensic review.” In this case, the bulk of the information we’ve been able to glean about the InMovement Treadmill Desk has come from the vendor’s own website—which is remarkably sparse on any details—and from seeing video demonstrations from a tradeshow at which Life Fitness launched this new sub-brand. There are no user reviews available anywhere online as yet, including on InMovement’s own website, and the company does not yet offer this product on Amazon, so there were no user comments to scan there. Read the Anatomy of a Product Review to learn more about our standard and forensic review processes. In this product category, the first thing we look at is the treadmill base. Among Life Fitness’s offerings, the InMovement’s treadmill looks to be based on their T5 treadmill, with some changes to make it more walk-ready. We recommend walking between 1 – 2 mph for optimal health and productivity, and the InMovement’s top speed of 2.0 mph keeps potential users within this range. The treadmill is controlled via a small membrane keypad embedded into the right side of the bumper guard that runs along the entire user edge of the desk. 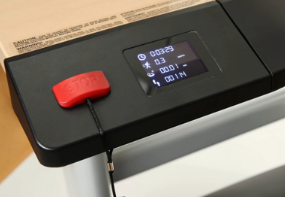 The controller adjusts both the speed of the treadmill and the height of the desk, while the small LCD display on the left side of the desk shows a user’s speed, time, distance, and number of steps taken. Though a step up from the droll display console on the Steelcase and Lifespan treadmill desks, it’s not in the same league as the smartphone-like console on the ThermoTread GT. The treadmill is rated to support users up to 350 lbs., same as LifeSpan’s TR1200 treadmill base but surprisingly shy (for the money) of the iMovR ThermoTread GT’s and Lifespan TR5000’s 400 lb rating. InMovement backs their treadmill with a 7-year warranty on the frame, with 3 years on the motor and 1 year on parts and labor. It’s a similar warranty to the TR1200, not as good as the iMovR’s, yet they both have a more robust lifetime warranty on the frame. The InMovement’s parts warranty—arguably the most important part of a treadmill warranty—is also a year shorter than iMovR’s ThermoTread GT and LifeSpan’s TR5000, which are both priced at $1499 (base only). InMovement copied not only the entire concept from Steelcase—down to the price point—but its egregious ergonomics as well. From photographs, the desk itself seems similar in design to the ergonomically-mistaken Steelcase Walkstation and the LifeSpan DT7. The motorized frame is directly attached to the treadmill frame, and a crossbar piece connects the two legs. The desktop is on the small side at 31.4″ x 40″. By contrast, the Steelcase DT7 desk is 47″ wide, the Steelcase Walkstation desk is available in an extra-wide 66″ width, and iMovR’s treadmill-optimized Omega adjustable-height desk models—which can be paired with any standalone treadmill base—can be configured with 42″, 47″, 59″, 71″ or 83″ tabletops. What does make the InMovement’s desktop unique among integrated treadmill desks is the built-in connectivity panel located at the back of the desk, which is an interesting approach to cable management: They allow users to charge phones, and connect laptops and monitors directly above the desktop. We’re not sure that that alone would make the unit worth its $4,599 sticker price, but it is a distinctive feature of InMovement’s product. We’ve reached out to the company for an evaluation unit to put through our usual gauntlet of tests. We’re especially keen on seeing how that nifty-looking connectivity panel handles cable management, as well as what kind of ergonomics their desk places users in. Like the Steelcase and LifeSpan desks there appears to be a thick rubber wrist wrest between the user and the keyboard and could exacerbate “computer hunch,” and make it difficult or impossible to install an ergonomic keyboard tray. Specs on the InMovement treadmill desk are sparse. They don’t publish the height adjustment range of the desk, noise signature or motor specs, for example, but these are things we’ll evaluate in our full review. Until then, take a look at the other Integrated Treadmill Desks we’ve reviewed. If you’re interested in a desk that can work with a walking treadmill base, check out our adjustable-height desk reviews. To be the first to know when our full, comprehensive review of the InMovement Treadmill Desk is out, subscribe to our online newsletter. To get a good 360 view of the InMovement Treadmill Desk check out this segment on a Chicago morning news program (home city for InMovement). Not surprisingly given the cardio equipment roots of the company, the focus of their demonstration was on “getting a workout at the office.” That’s not what treadmill desking is supposed to be about, and of course no one even tried to use a computer while walking. Also shown in the clip is InMovement’s “bi-stride” two-person treadmill desk.